When Doris Lessing, age 89, finally won the Nobel Prize in Literature in 2007, her response was, “Oh, Christ.” Lessing’s name had been floated for years, and she had given up hope--or had simply stopped caring. 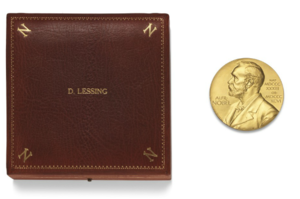 Best known for her 1962 feminist novel, The Golden Notebook, Lessing was the eleventh woman to win the coveted award. She showed up in Stockholm, gave her speech--highlighting the “hunger for books” and the lack of access to them, particularly in her native Zimbabwe (then Rhodesia)--and went back to writing. She died in 2013. Now her prize is headed to auction, estimated to reach £150,000-250,000 ($200,000-335,000) at Christie’s in London on December 13. In 2014, Lessing’s executors donated her personal library of some 3,000 volumes was to the city library in Harare, Zimbabwe. She had long supported literacy and library charities in the region. When Doris Lessing, age 89, finally won the Nobel Prize in Literature in 2007, her response was, "Oh, Christ." Lessing's name had been floated for years, and she had given up hope--or had simply stopped caring. Best known for her 1962 feminist novel, The Golden Notebook, Lessing was the eleventh woman to win the coveted award. She showed up in Stockholm, gave her speech--highlighting the "hunger for books" and the lack of access to them, particularly in her native Zimbabwe (then Rhodesia)--and went back to writing. She died in 2013. Now her prize is headed to auction, estimated to reach £150,000-250,000 ($200,000-335,000) at Christie's in London on December 13. In 2014, Lessing's executors donated her personal library of some 3,000 volumes was to the city library in Harare, Zimbabwe. She had long supported literacy and library charities in the region.